Predictions-01 – Dr. Turi M.D.U.S. September 11, 2001: Was It Prophesied? 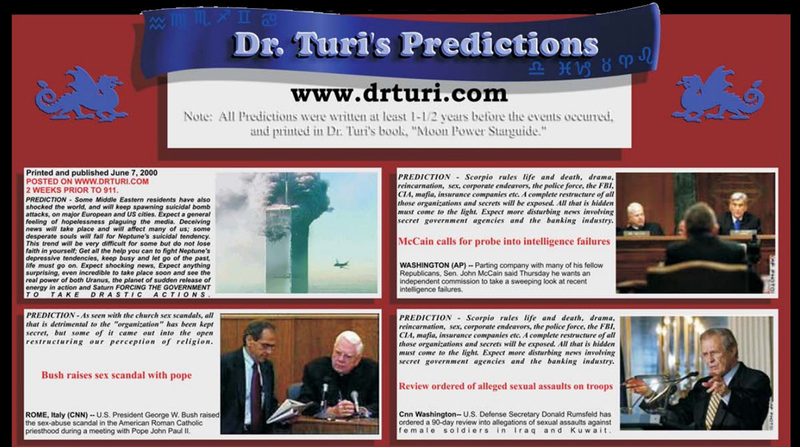 DISCLAIMER Dr. Turi’s Website is VERY Very Real And NOT for Entertainment Purposes Only! 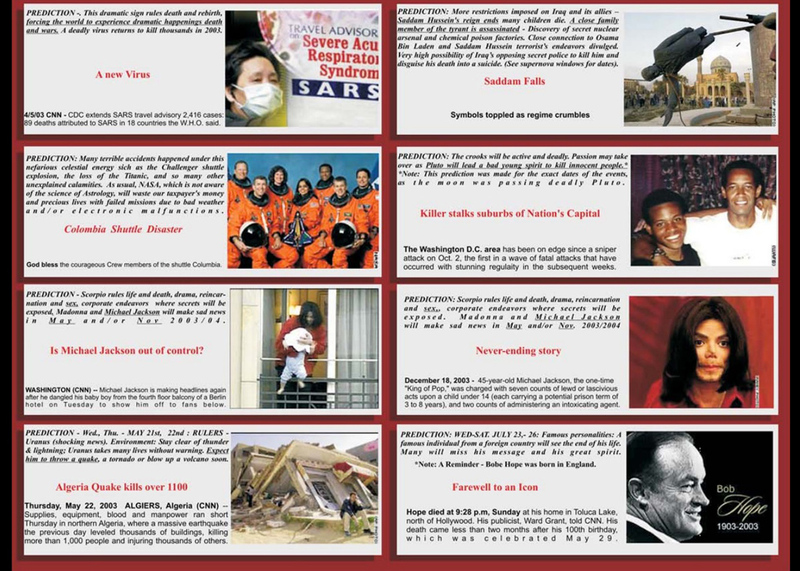 March 2011 Japan Deadliest Earthquake/Tsunami – N.Y Terrorist Attack – Iraq War – SARS – Asia Tsunami – Mexico Oil Spill – Icelandic Volcano Eruption – Haiti Deadliest Quake Ever, Deadly Hurricanes, Shocking News, Nukes , California Fires, Deadliest Tornadoes In The US History, ALL major calamities world wide including the full restructure of the FBI/CIA, the US economy, Mumbai India UK terrorist Attacks etc. ALL Major Earthquakes Above 6.0 were FULLY and UNARGUABLY predicted in my book Moon Power and on my radio and television shows. I am the only Astrophile on the planet posting regularly my “SOS To The World” windows in all major websites preparing humankind for its impending fate. Of course people can accurately judge or swear by my predictive gift only if they paid attention to my work and get to know the real me. Until then a newcomer can only be skeptical! Take the time to investigate my mission to translate the Creator’s will upon mankind and understand the “Cosmic Code” because this is the only way God will speak to you. Remember God’s words “I will speak to you…you won’t hear me, I will present myself to you, you won’t see me!” Only those who master the cosmic hieroglyphs will understand and heed God cosmic divinity!